It doesn’t matter how much or how little you garden, or how complex or simple your garden is, evergreens are going to be an essential part of it. They provide structure as screens or hedges, and they fill out empty corners with the perfect background. Around the house they give permanence to your foundation planting, and in the garden they keep things calm on the eyes, while flowers and leaves come and go around them. Evergreens are essential, but we don’t want them to take up our time or be ‘fussy’ and difficult to grow – no, we want them to do their thing quietly and efficiently in the background, with a periodic trim being about all the care they need. If you are looking for evergreens like that, which are attractive all year round, yet never ask for much at all, then Cherry Laurels are the plants for you. Convinced yet? Truly, Cherry Laurel – which comes in several forms in different sizes, depending on your garden and your needs – is the top-pick evergreen of every smart gardener. 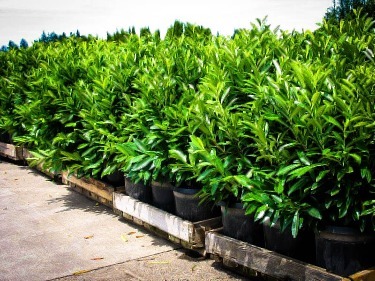 Cherry Laurel comes in lots of sizes, but it always has simple, oval leaves that can be 4 to 8 inches long, depending on the variety. The leaves are glossy, and a rich, healthy green color, so they always look good in your garden. It grows naturally into a dense shrub, so its ideal for screening or filling spaces, even if you don’t bother to trim it. It is hardy anywhere from zone 6 to zone 8, so outside of the colder states, it can be grown all across the country, except for Florida and southern Texas. In spring untrimmed plants will produce upright clusters of white scented flowers, sometimes followed by black berries. Just one warning, although birds love them, those berries can be bad for you, so don’t let your children go sampling them. Plants that are regularly trimmed rarely produce flowers or berries, and you can avoid berries by trimming after flowering is over. 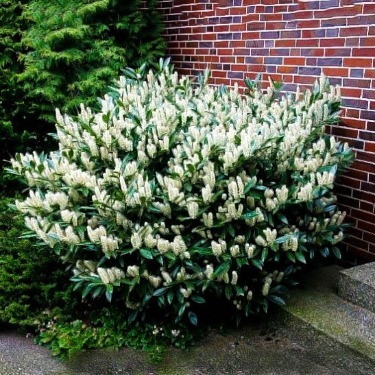 In some parts of the country Cherry Laurel is called English Laurel, so when buying it look for it by its scientific name – Prunus laurocerasus – and you can’t go wrong. It came to America with the early settlers, who knew a useful plant when they saw one, but before that it grew wild around the Black Sea. Every garden has areas of shade – often deep shade, beneath larger trees, and there the soil is often dry too – literally a killer combination for almost any plant. But not for the Cherry Laurel. It is renowned for its ability to survive in those darkest corners – it may not grow quite so dense, but it will make a respectable filler where almost nothing else will grow. If those spots are problem areas in your garden, then the problem is solved. Of course it will also grow in partial shade and full sun too. Cherry Laurel will grow in almost any soil, no matter if it is sandy or clay, wet or dry. It is happy in urban areas, and air pollution doesn’t bother it – it fact it cleans the air for you. Deer almost never eat it (never say ‘never’ about deer!) and it has no pests or diseases that trouble it or need spraying or other controls. If this sounds too good to believe, it really isn’t – you will see when you start growing it. If your goal is to improve your garden, and not interfere with your other activities, then this is the plant for you. This variety is so special it won an award from the Royal Horticultural Society in England, so you can see how good it is. For smaller gardens this has become the ‘go to’ choice, and no wonder. 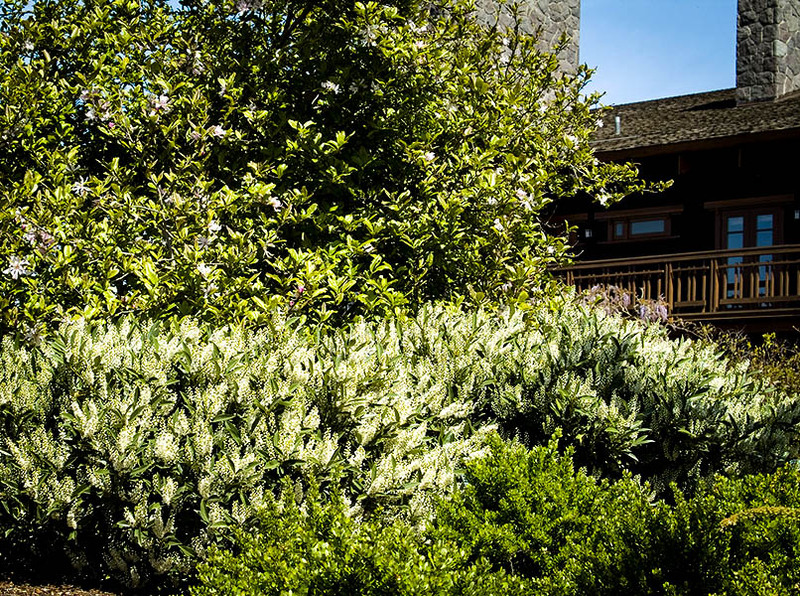 Unlike the big old-fashioned forms, this shrub grows wide, and not so tall. It will usually reach just 3 or 4 feet tall, but that plant can be 6 or 8 feet wide. The leaves are smaller too, making a lovely compact plant. Use it to fill larger spaces, without blocking the view from windows, or from across your garden. It may eventually start to grow taller, but if you don’t want that, just take your pruners and cut off any shoots that push up too tall – it’s that easy. This low growth makes it ideal for planting around your home, or for making a low barrier between one part of your garden and another. Use it for a friendly hedge that shows where your property starts but doesn’t block chatting with neighbors. Apart from its low height, the great thing about this variety is its flowering. While other Cherry Laurel produce a few flowers, this one is smothered every year is a bold display of creamy-white blooms that almost hide the foliage. A light trim after flowering will prevent any berries forming, but if you trim it much outside that time you may reduce the quantity of flowers, which would be a shame. Also known as Schikpa, or by its full name as ‘Schipkaensis’, this should be your first choice for that big screen or hedge, that is going to give you privacy and quiet all year round. That’s right, not only does a dense evergreen hedge block prying eyes or ugly views, it filters noise, turning your garden into a tranquil haven. As well it filters the air of dust and pollutants – so it’s a win-win all round. 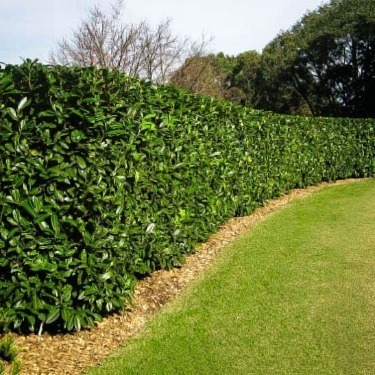 The Skip Cherry Laurel will become a ten-foot hedge is four or five years, if you water and fertilize it regularly. Yes, you did read that right. In just a few years you have a mature screen of handsome rich green foliage. You can prune it into a neat hedge, or just let it grow naturally into something more casual, but just as beautiful. Over time it may grow well over 15 feet tall, and be about 6 feet wide, so allow enough room when planting so that it doesn’t develop space issues. Plant at least 3 feet from a wall, fence or boundary, and space your plants 4 or even 5 feet apart for a screen. This variety is a selection of unknown origin that grows to a medium size of 4 to 6 feet tall – right between the other varieties, making it ideal for a low privacy hedge, or for a taller, background plant behind your flowering shrubs. It is versatile enough to use almost anywhere in the garden, especially in those dark, shady spots where you can’t get other plants to grow. Whatever variety you choose, you can plant with confidence, knowing that your Cherry Laurel will do the job you have chosen it for – easily.